The Stag did not win at Bowie this year (1997). A beautiful Mallard Stag that was completely restored from the ground up, took this show. The Stag is finally receiving the attention that it deserves and we look forward to seeing many more restored Stags over the next few years. Our car still looks good, but 4 years of wear and tear are beginning to take their toll. We will continue to show the car, but more to drive the car and be a part of the event, rather than to try to win. 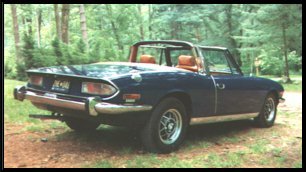 The Triumph Stag is a fantastic car that never really deserved the lack of effort that British Leyland placed in solving the problems of the first few years of production. It was an excellent design (concept) and could have been a great success. Through the effort of a few dedicated enthusiasts, the Stag will live on and offer the brave owner, one of the classiest rides available anywhere. The combination of open air motoring, combined with V8 sound and power, all wrapped in a designer Italian body, is only available to the proud owners of the Triumph Stag.